KISSIMMEE, Fla. — The wife of a former Marine and Iraq war veteran is set to be deported on Friday unless President Donald Trump intervenes. Her husband, Cuauhtemoc “Temo” Juarez, who describes himself as a conservative who voted for Trump, wrote the president a letter that was delivered through his congressman asking for a reprieve, according to Stars and Stripes. Alejandra Juarez, 39, entered the U.S. illegally from Mexico when she was 18, escaping violence in her home country. Three years later she met and married Juarez in Florida. Temo served in the U.S. Marine Corps and later joined the Army National Guard in Florida. He came to the U.S. from Mexico as a child and was naturalized days before he was deployed to Iraq. The couple has a 9-year-old daughter and a 16-year-old daughter, both born in the U.S.
On Tuesday, the family, who lives in Davenport, Fla., received a call from their attorney saying Immigration and Customs Enforcement agreed to review her most recent “parole in place” application, but they have rejected her previous three applications, according to Stars and Stripes. “I love this country. This country has given me great things because we have worked hard. But the America we are living in now is getting full of hate,” Alejandra said. Alejandra checked in regularly with immigration authorities, during former President Barack Obama’s administration, and says she was always told she is not a criminal and has nothing to worry about. Now, with Trump’s “zero tolerance” immigration policy, few exceptions are made for unauthorized immigrants even in cases when a crime has not been committed. “Before you enlist in the military, think it twice. Before you marry an immigrant, think it twice. Think if it’s really worth it for you to serve this country, because look how they treated me,” Alejandra said, through tears. 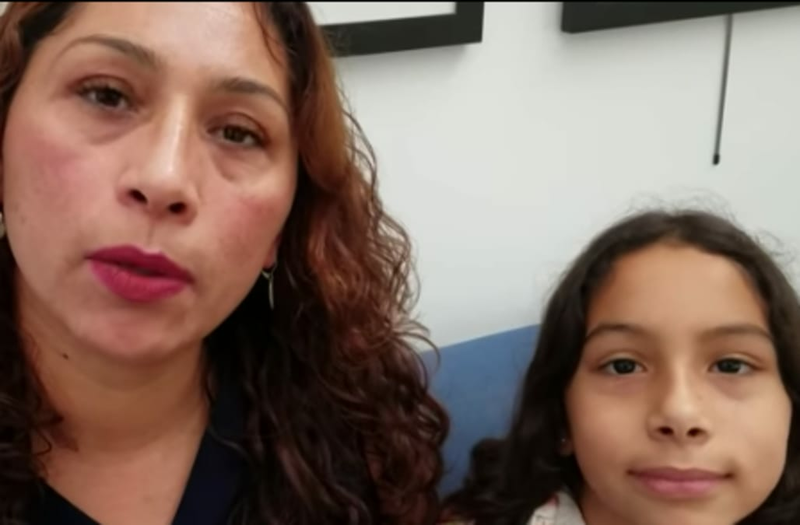 If she is deported Friday, she will take her 9-year-old daughter, Estela, with her to Mexico while her 16-year-old daughter, Pamela, stays with her father in Florida. “It makes me sad, mainly because I tell my mom everything. And she always supports me … And now that I’m getting older I’m going to have more problems and issues that I’m going to need help with and I want my mom to be there with me," Pamela told NBC News. The family of four is hoping for the best. “We are just going to hug each other at night very tight and pray more. Pray like we have never prayed before. Keep fighting and keep praying,” Alejandra Juarez said. Reporting by Carmen Sesin in Miami and Anthony Terrell in Tampa and Kissimmee; video by Jesse North.